BOCA CHICA, Dominican Republic - Twenty years ago, whenever Sal Agostinelli traveled here as the Phillies' international liaison, he first hoarded supplies. The Phillies had leased some land in 1997 to boost their presence in the Dominican. The enterprise was crude. The team's space did not include a weight room. "So I went to Modell's," Agostinelli said. The Phillies' director of international scouting purchased weights, 100 pounds for every trip abroad, at the sporting-goods store. He lugged them each time to an overhead compartment on a commercial flight, an absurd operation that stuck in his mind last week as he surveyed the $9 million palatial complex his team just built. "It's hard for me to believe we are in such a beautiful place," said Agostinelli, who lounged in a concrete dugout earlier this month while a bunch of 16-year-olds practiced on one of three manicured baseball diamonds. Sal Agostinelli at the Phillies academy in Boca Chica, .Dominican Republic. The gambles are larger in this impoverished country that has produced the most foreign major-league talent. The Phillies, budget-conscious before in the international realm, have dedicated more dollars to scouting and signing bonuses for teenagers in recent years. They are outspent by other clubs, but Agostinelli's crew has sustained success. Procuring amateur talent abroad is an imperfect process; teenagers are difficult to project and their buscones, or street agents, wield influence. The Phillies searched for a sliver of certitude. So they partnered with the Minnesota Twins to purchase 45 acres of land accessible by a winding road littered with trash and abandoned buildings, and constructed a complex with which they hope to nurture young talent. It opened in January. "It exceeds my expectations," team president Andy MacPhail said. "And my expectations were pretty high. If you go up to our tower, take a picture and say, 'Where is it?' I don't think I would have said the Dominican Republic." 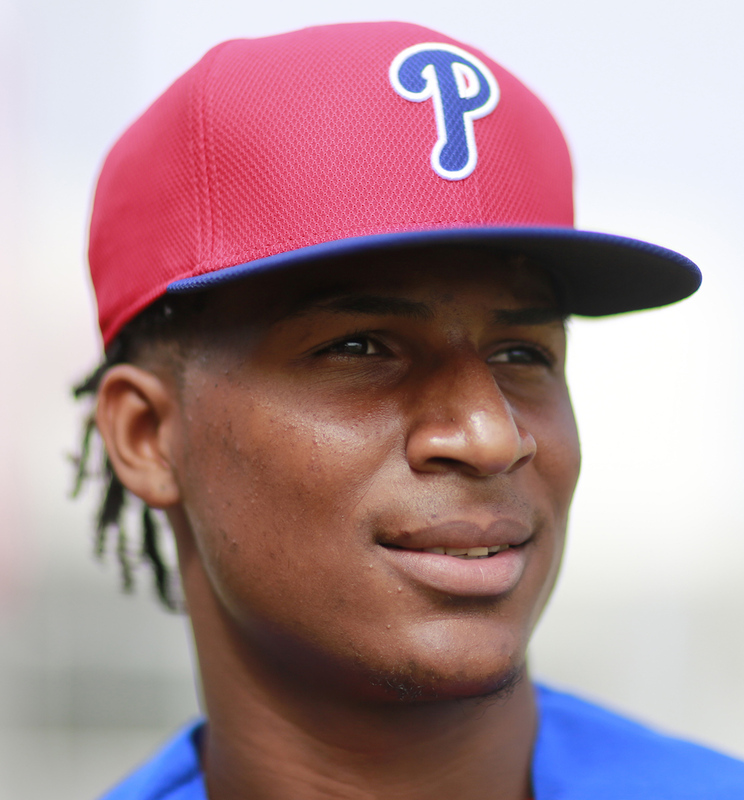 The Phillies wanted something that felt like home for their youngest employees, the fresh-faced Latin American ballplayers who face the longest odds of achieving their ultimate goal. Why? The Phillies spent less in 2016 on their major-league roster than they had in a decade. They applied some of the savings to neglected areas. "I am a huge proponent, as is our ownership, of taking this opportunity to make significant investments everywhere up and down the organization," MacPhail said. "Not only do you have this state-of-the-art facility, but we've expanded personnel." 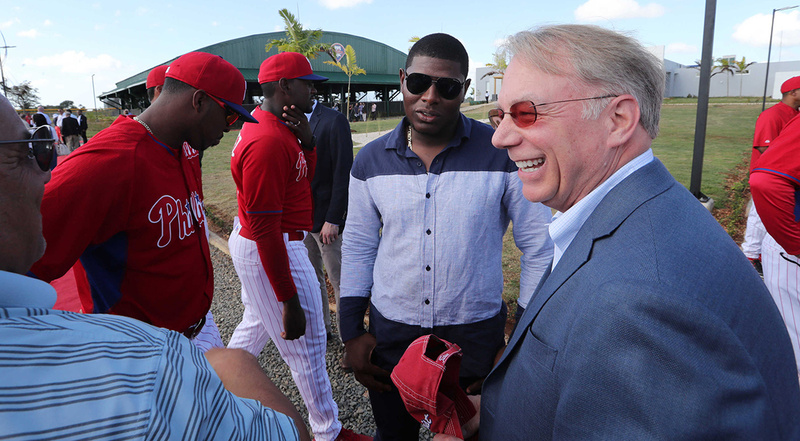 Phillies president Andy MacPhail (right) chats with relief pitcher Hector Neris at the Boca Chica academy. In doing that, the Phillies contemplated ways to improve life for their minor-league players, who are not unionized and are paid a pittance. It is not a groundbreaking tactic, but one that baseball has just started to embrace. Minor-league players are supposed to "pay their dues" before earning big-league luxuries. Some organizations have revised that thinking, to some extent. The Phillies invested in nutritional, catered meals for their domestic affiliates. In the Dominican, they wanted to create comfort. The players can take their English classes in an air-conditioned room with comfortable chairs. They will be better fed. They have a reliable internet connection, two blue-felt pool tables, and some flat-screen TVs for video games in the dorm. "You'll send a happier player to bed," said Joe Jordan, the Phillies' director of player development. "A happier player is going to wake up ready to get after it the next morning." 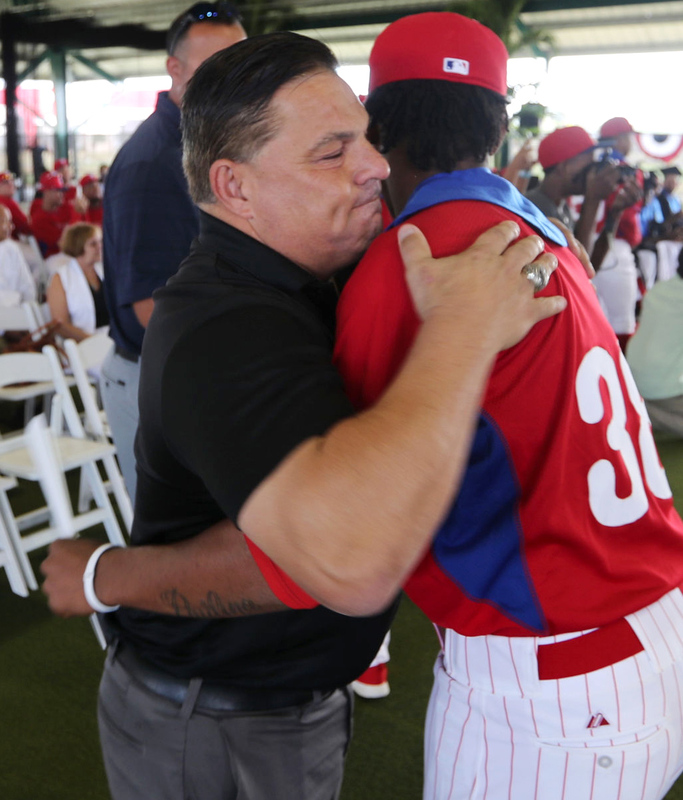 As Agostinelli toured the 50,000 square feet of building space earlier this month, he thought of Carlos Ruiz, the Panamanian catcher who signed for $8,000 and caught the final pitch of a World Series. The gregarious scouting director video-chatted with Ruiz to show him how much had changed. Ruiz trained as a young player at the team's first complex on leased land in La Vega, the country's third-largest city. It was located near Rio Camu, which often overflowed. "The people from the river had to live in the stadium," Agostinelli said. "There was no place for them to live. So they lived on the third-base side. All of our players lived on the first-base side." Sometimes, Ruiz slept under the stands. The two men laugh about it now. Things are different. Every big-league team operates an academy in the Dominican, and most have constructed state-of-the-art facilities in recent years. Signing bonuses for top talent are seven figures. The competition for top talent has never been more cut-throat. The new academy in Boca Chica, Dominican Republic. Major League Baseball has noticed. Owners have long lobbied for an international draft, designed to trim amateur costs and streamline the acquisition process. They settled, instead, for a hard salary cap in the new collective bargaining agreement. The Phillies had planned their complex before that provision leveled the international playing field; Agostinelli credited former assistant general manager Benny Looper as a pillar of support. But team officials now envision a possible competitive advantage. An international amateur's offers could be closer than before because every team is allotted a similar amount of money with less flexibility to exceed it. One potential, unintended consequence: A recruiting process much like college athletics, with a major-league team selling a Dominican teenager on its facilities, coaching and education capabilities. "As we all start to learn about the impact the new system is going to have, we'll start to adapt and compete," MacPhail said. "Just through timing, the Phillies are well-positioned to deal with what sort of may be a new reality." New major-league complexes have sprouted in Boca Chica almost every year. The Phillies and Twins partnered to reduce operating costs; they share an auditorium and a kitchen, but the rest of the facilities are separated. There are more fields, batting cages, pitching mounds and lockers than before. The size of the weight room has tripled from previous locations. Gone are the rooms crammed with enough beds to sleep 30; now 78 players can live in a dorm, with six to a room and some modicum of privacy. The details are meticulous, to the backsplashes in the bathrooms and the ornate wooden doors throughout the buildings. "It feels more like a home to me," said Sixto Sánchez, 18, one of the organization's top pitching prospects. For the first time, the team's Dominican operation has a high-speed internet connection. The fields have cameras that will upload video to five workstations inside the academy; Dominican players can now analyze their mechanics. All of the recorded video is accessible in Philadelphia via the team's internal system. The team wants to educate more Dominican players, even if the overwhelming majority never leave the island. There is more classroom space, and there are more computers and teachers than ever. "The game moves exponentially quicker," said MacPhail, 63, as he snapped his fingers three times. "Every minute you're not moving and standing still, you're falling behind. I'm sure it's not unique to baseball. Businesses are like this. Someone is trying to get an edge on you. "There is a lot of talk in how that edge may be a statistical formula that derives a truer sense of the value of a player. But how about the environment you put the player in? How about the opportunities you give them beyond baseball to improve themselves like we are here in the Dominican? Your environment has to mean something. We've made a significant investment in trying to improve the environment." 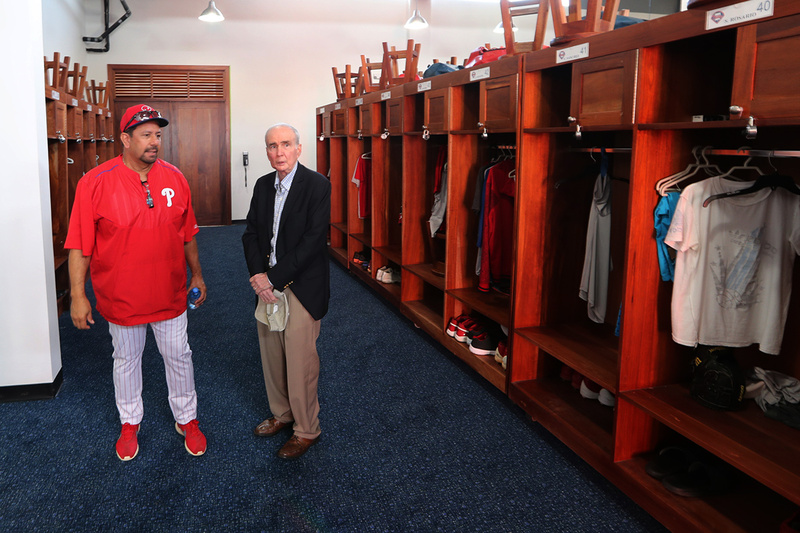 Carlos Arroyo (left), a pitching coach, stands with Phillies part-owner David Montgomery in the locker room at the new academy in Boca Chica, Dominican Republic. Skeptics will point to the prevailing notion that nothing but money matters to a young amateur and his buscon. Jordan, in charge of player development, sees the complex as a crucial expense. "The reality is players sign here when they are 16," Jordan said. "In the United States, they are 18 or older. The earlier you get them, they are more impressionable. You can mold them. That first year is when you build your base." Beyond the $9 million price tag, ownership has showed heightened interest in the international operation. John Middleton, Jim Buck and David Montgomery — members of the ownership group — attended dedication ceremonies in the Dominican Republic in January. General manager Matt Klentak and Pat Gillick, a senior adviser, accompanied MacPhail. No one needed to bring weights as carry-on items like Agostinelli 20 years earlier. "It's a tough game," MacPhail said. "We pay these salaries because it is a hard sport to excel in. The thing that carries so much value in today's game are young, productive players before they reach their earning peak. So if you can do a little better than the other guy, starting here, it is money well spent." Part 3, coming Wednesday: Roughly 10 percent of the players who live at the Phillies' Dominican academy will ever leave the island to advance their baseball career, let alone make it to the majors. Life after baseball, which affords so few guarantees here, can be difficult. That is why the Phillies, since 2012, have offered a subsidized high-school education for their foreign players. Before, only English classes were mandatory. 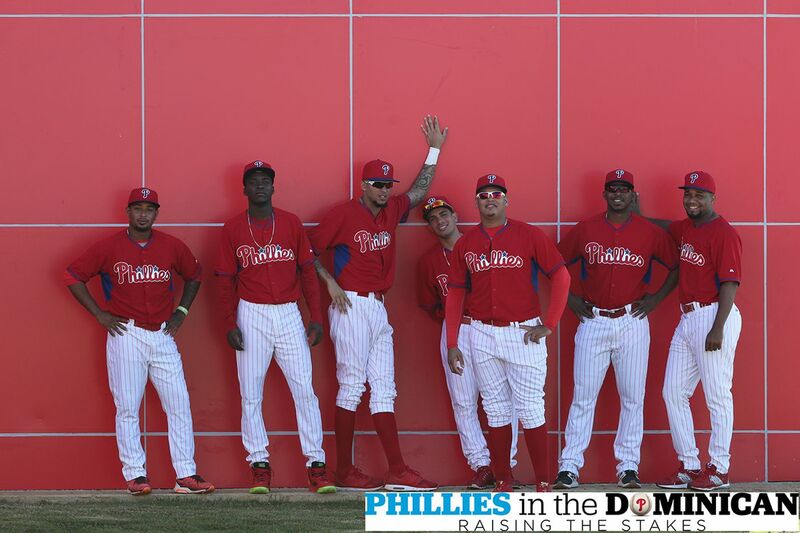 The team has adopted an altruistic approach, given that many of these players will never step inside Citizens Bank Park. But there are practical reasons for the education.